Southern Africa, east of Angola. Angola 1,110 km, Democratic Republic of the Congo 1,930 km, Malawi 837 km, Mozambique 419 km, Namibia 233 km, Tanzania 338 km, Zimbabwe 797 km. Religions: Christian 50%-75%, Muslim and Hindu 24%-49%, indigenous beliefs 1%. English (official), major vernaculars - Bemba, Kaonda, Lozi, Lunda, Luvale, Nyanja, Tonga, and about 70 other indigenous languages. 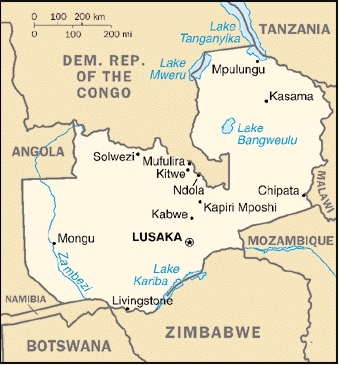 9 provinces; Central, Copperbelt, Eastern, Luapula, Lusaka, Northern, North-Western, Southern, Western .